Weaferinteriors SG Single glazed flush look 3 part base track has been designed to sleekly compliment the EVOLUTION partition system. Designed with single to double transition in mind, the base track height marries into the flush look on the single glaze track along-side single glaze and double glaze door frames, from both inside and out-side the office environment, visually this gives a flush wall of glass look at the base detail. 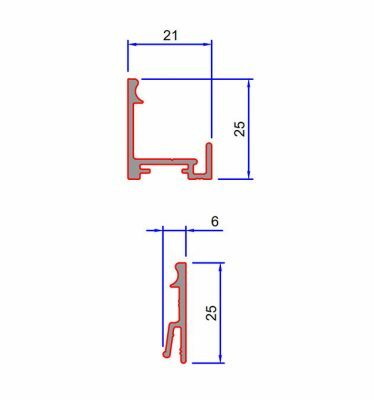 The product is supplied in extrusion length and comes complete with a choice of either 4mm or 5mm clear gasket rod profiles which insert into the base clip in profiles. Aluminium lengths as standard are 3000mm in length, supplied in a standard Mill finish or RAL9010 white / 9006 silver / 9005 black or any other UK RAL or BS colour subject to paint set up conditions, SAA anodised finish is also available upon request. We utilise either our own fleet of vehicles or external couriers for delivery to your project.